Kwanzan cherry trees could easily be called one of the showiest trees in a landscape. These trees are the trees that you imagine in your mind, most often, when someone refers to a blossoming cherry tree. 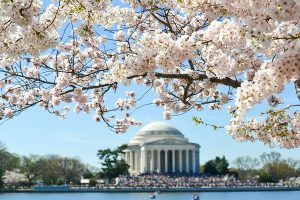 In fact, Japanese cherry trees are celebrated annually at the National Cherry Blossom Festival in Washington D.C. during the spring months of March and April. Prunus Kanzan tree is a type of flowering cherry tree. These beautiful deciduous trees grow between 25 ft. and 30 ft. in both height and spread. Generally speaking, each Kwanzan cherry tree for sale that we ship, does not need to be pruned as it grows and matures. Younger trees tend to be narrower shaped and with maturity its spread grows wider. In the spring, you’ll see red buds that eventually flower into a deep pink, double flower creating the spectacular display that we are all familiar with. Our Japanese flowering cherry trees for sale, Prunus Kanzan, or Kwanzan cherry trees for sale should be planted in well-drained soil in full direct sun after you receive your purchase from us. G & S Trees, Inc. offers the very best varieties of cherry tree for sale in our online store and at our locations. We also are well known for our Christmas time greenery and ornamentals. If you are looking for real garland and fresh Christmas greenery, please order direct and contact us. You can search our online landscape and plant store for the best deals year around.